The success this weekend of “Cinderella,” Disney’s new live-action, redemptive fairytale for family audiences, which came in No. 1 at the box office with $70.1 million, is part of the growing trend of popularity of family-friendly, redemptive movies with top actors and directors. Notable director and Shakespearean actor Kenneth Branagh (“Hamlet,” “Henry V” and “Thor”), directed this live action update of “Cinderella” for Disney with some of the best acclaimed actors. “Cinderella” is part of a growing Renaissance of artistry and Reformation of content in the increasing trend of producing family-friendly, redemptive movies with top box office draw. It’s a trend that Movieguide® and its founder, Dr. Ted Baehr, has played a strong role in helping to promote, as reported by many top executives, producers, filmmakers, and artists in the entertainment industry have admitted to us during our Annual Awards Gala and in personal meetings and telephone conferences Dr. Baehr has had with them. During Shakespeare’s lifetime, there was both a Renaissance of artistic expression in England and a Reformation of content in England due to the influence of Queen Elizabeth the First. We also see this trend happening again worldwide. As a result of its impact on Hollywood, Movieguide® has been able to establish affiliates and supporters in faraway countries, including Japan, Australia, England, Germany, India, South Korea, and even Russia. In fact, we are hearing from a growing number of people in China and Latin America asking for the same thing. A little-known fact about this trend is the impact of the ever-expanding, user-friendly options of new technology, which gives filmmakers and artists access to the best artistic events, performers and directors through presentations and broadcasts on big and smaller screens, including television, local theater screens and computers. Rich gifts to uplift human spirits around the world are available more and more widely on various types of screens around the world. For example, the best live Shakespearean performances are now being broadcast both in real time and filmed and then broadcast live with the best of Shakespearean actors and directors from legendary halls to theaters all over the world. Some of the best in American television programming includes live broadcasts in real time or filmed then broadcast live from the places like the Lincoln Center, the Kennedy Center, the Washington Mall and the Capitol Lawn in Washington, D.C., and more. The Kennedy Center, for instance, provides many live broadcasts of performing arts events from the following: the National Symphony Orchestra, the Washington National Opera and the Susan Farrell Ballet. They offer almost daily live broadcasts of exquisite performances from around the world mid March and into the spring. More and more modern technology is facilitating and providing broad, user-friendly access to the modern Renaissance of great artistic performances and to the Reformation of content for large and small screens. For television and even theaters, Roma Downey and Mark Burnett are producing redemptive, biblical programming with uplifting content. Following the success of their “Bible” miniseries for the History Channel, Burnett and Downey have produced a sequel, “AD: The Bible Continues” for NBC as a 12 episode series scheduled for debut on April 5, 2015. Covering the events that took place after the crucifixion of Jesus, “A.D.” follows the conflict around Christians and the beginning of the church. They are also producing other positive programming. Their success seems to be inspiring others in the television industry. Thus, Movieguide® has seen overt Christian content in such things as Tim Allen’s series “Last Man Standing,” “NCIS,” the summer series “The Last Ship,” and even in Reality TV (e.g., “Duck Dynasty”). Along with this development there has also been the growing phenomena of mainstream studios, directors, and actors involved with redemptive movies that have been top box office movies in theaters with staying power. These redemptive movies have basically told stories people making something better or of saving people from dangerous, harmful and/or evil conditions for what is good, beautiful and eternal. Redemptive movies (while being authentic, honest and believable) entertain with stories that are edifying, enlightening and/or educational that reinforce universal ideas of unconditional love and biblical morality. They don’t entertain viewers with what is degrading, devaluing or destructive outside of these values. They also include the best artistic quality, including cinematography, writing, directing, acting, and more. 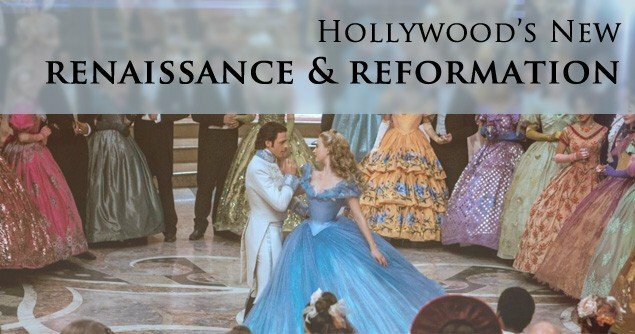 To date, box office statistics, Fandango and ongoing MOVIEGUIDE(r) research make it clear that the past decade has been marked by an increasing number of best practice redemptive movies with top box office draw and staying power for all ages produced by mainstream studios, directors, and actors. Box office and home video records indicate a growing popular interest in family values/redemptive movies, movies with box office draw and staying power. There has been a growing acceleration in production of best practice redemptive movies by independent and Hollywood studios and companies in the midst of accelerating evil, darkness and danger overseas. It was clear in recent red carpet interviews in Hollywood at the Movieguide® Awards Gala events that studios executives, directors, actors, and their associates want to work more often on redemptive movies. This past year was especially marked by many successful redemptive movies by independent and mainstream studios and companies, including “Heaven is for Real,” “God’s Not Dead,” “The Hobbit: The Battle of the Five Armies,” “Unbroken,” “The Giver,” “The Hunger Games: Mockingjay – Part 1,” and “The Son of God” and many more. Mojo Box office reveals that 2015 has already been marked by some popular, successful redemptive, family-friendly movies like “Cinderella,” “Paddington,” “McFarland, USA,” and “Black or White,” with even more yet to come, such as this Friday’s opening of “Do You Believe?” from the folks who made “God’s Not Dead,” Burnett and Downey’s “Little Boy” on April 24, two new animated movies for families from Pixar, a new “Despicable Me” movie focusing on the Minions who serve Gru, the Kendrick Brothers new movie “War Room” on August 28, and more in the future such as “The Chronicles of Narnia: The Silver Chair” for 2016, a new “Ben-Hur” movie from Mark Burnett and Roma Downey, a new “Ten Commandments,” another movie about King David, and much more. So, stay tuned to Movieguide® for news about these and many other good movies. Editor’s Note: Dr. Howard’s personal website is www.dianehoward.com.